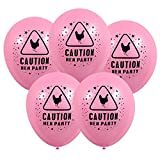 Pink Hen Party Balloons for your Girl’s Night Out! Balloons are approx 10″ and features ‘CAUTION HEN PARTY’ in Black writing. The Perfect Balloons for a fun night to remember, Coordinate with other Pink Decorations. We also sell a range of hen party accessories like Banners and Buntings, Willy Straws, Head Boppers, Hen Party Dare Cards.